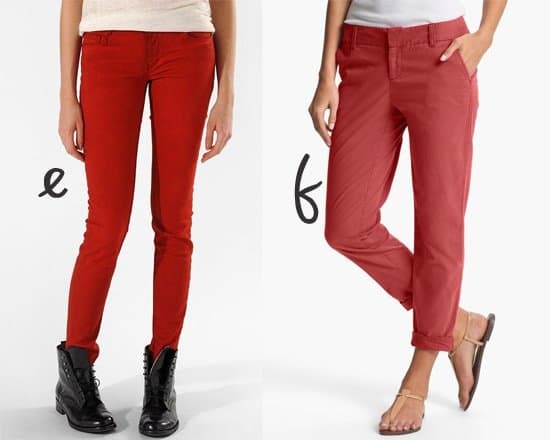 In a year, how many times do you wear red pants? Once? Twice? Never? If you wear red pants more times than you can count, pat yourself on the back. You, girl, are a force to be reckoned with, fashion-wise. But if you rarely glance at red pants, let alone wear them, you might want to revisit and revise. This is the best time to do so. We looked up some of the most covet-worthy looks of celebrities wearing these pants. We hope you’ll find them inspiring! Of course, not all of us have Nicole’s amazing abs, so if baring midriff is not your thing, wear a tank top instead. This pants suit look is great for different occasions — semi-formal events, work, and even play! We do suggest adding statement accessories just like Nicole’s long gold necklaces. Her bright red Hugo Boss pants are from the brand’s 20th anniversary collection and Nicole paired them with a “Malory” tank top from Theory and Saint Laurent black smooth calfskin “Janis” pumps. Edgy Kelly Rowland showed her knack for street style with this muscle tee plus red pants combo. It was a casual look, but she amped up the style meter by throwing in pointy-toe pumps and gold-tone accessories. Like Kelly, you can also wear your fitted red pants with graphic-printed muscle tees. This is a perfect festival or summer outfit! Kourtney’s high-fashion outfit is for those who are seeking more adventure with their red pants. The knee-high boots gave this an edgy and “couture” appeal. If you are unsure what color to wear with your red pants, you can’t go wrong with something navy just like Kourtney’s navy blazer. Snap a red jumpsuit, and then break off the solid one-piece look with a cropped jacket. It sure worked for Miley Cyrus. If you are going for a color as bold as red, you might as well go all the way and wear it with something printed. Padma’s printed jacket is a perfect option, with its graphic details and stud embellishment. The ShoeDazzle founder styled her Balenciaga leather pants with a black Faith Connexion tuxedo blazer and a gray Monroe V-neck tee. Katharine McPhee looked fabulous in wide-leg high-waist pants from Styland at a photo call for the musical ‘Waitress’ in New York City. The American actress, singer, and songwriter styled her versatile pants with a Veronica Beard blazer, a Bodywrap bodysuit, Gianvito Rossi shoes, and 8 Other Reasons earrings. 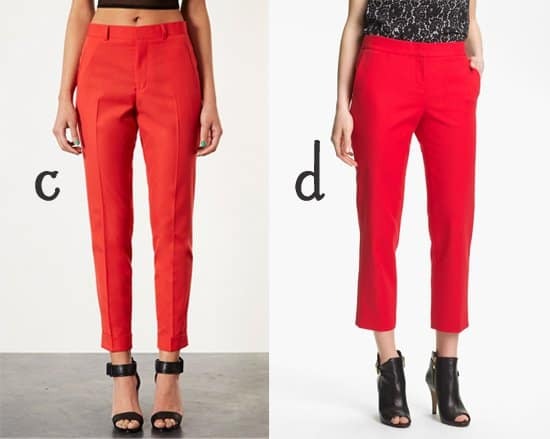 Of course, the many ways to style a pair of red pants don’t end with these celebrity outfits. Go discover how you can inject this staple into your personal style. 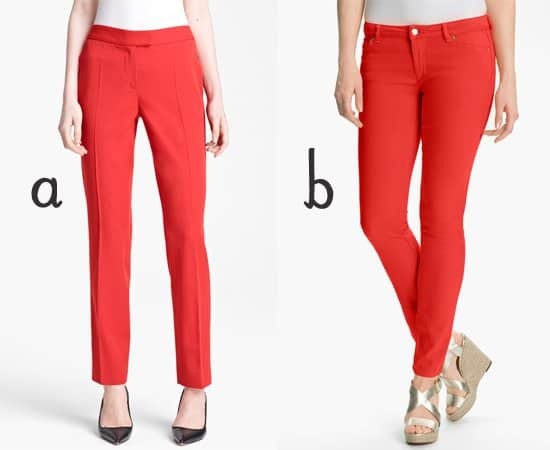 Who do you think looked best in red pants? Please let us know by leaving a comment below!